First, just let me explain. You guys know all about my younger brother, Red? He’s the 16-year-old that snowboards (a lot), and doesn’t really go to school…for real. Instead he travels and snowboards, and apparently eats pizza in Italy topped with french fries. What? I mean, I didn’t know Italians put french fries on their pizza, but Red has been trying to tell me it’s a thing and that I’ve got to do it. I don’t know where exactly in Italy he was eating his pizza, somewhere in Milan I guess, but I mean, he says it’s a thing. Seeing as I’ve never been to Italy, I’m going to have to take his word for it. I will not lie though, at first I totally thought, “ahh, that’s weird”. But then I started to think about it, picture it, and then I was intrigued. Maybe it could be good. Maybe if I made the crust extra thin, loaded it with extra cheese (obviously) and then topped it with extra thin, crispy fries. Like maybe…it might even be delicious? So I tried, tried it three times to be exact, and you know? It is DELICIOUS! Here’s the thing you should now. It’s rare that Red says he likes a certain food. He’s a pretty bland and boring eater, but for once, I wanted to make a recipe he’d like. Finally this pizza was the answer. Actually, I had this pizza all hot and ready for him when he FINALLY arrived home yesterday after many, many hours of travel and being gone for 40 days! And just to really let him know how happy we were to have him home, I also had a few still warm cookies waiting as well. I think he was pretty pumped. I will not even try to deny that this pizza has pretty classic flavors. Nothing crazy or out of the ordinary happening here, but trust me – it is still SO good. 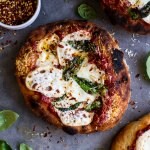 Sometimes I can get so wrapped up in developing crazy recipes full of a million flavors and layers of texture, that I forget that something simple, like cheese pizza, is still a really delicious meal. I make so many recipes a day that aside from this pizza, I cannot even remember the last cheese pizza I made. And guys, I love straight cheese pizza…I mean, who doesn’t! Well, this pizza can’t really be called a plain cheese pizza, thanks to the fries, but I do think the fries add something special. 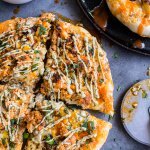 They make the pizza a little different, but different in a way that everyone can like, no, in a way that everyone can LOVE! Hello, we’re just adding a few crispy oven baked fries to a CHEESE PIZZA. Now come on, how could that not be just amazing?! Plus, I’m pumped that I finally have a recipe on the blog that Red will willingly eat. YES. Meaning…any of you parents out there who have picky eaters, my guess is that they too will be all over this pizza. Which means you can create a dinner that your whole family will actually enjoy! You are SO welcome. This is a quick, easy to make, super cheesy, and totally delish recipe. Perfect for just about any night of the week, and perfect to serve to just about anyone…from the super classy (because even you cool and classy peeps like to eat pizza and fries!) 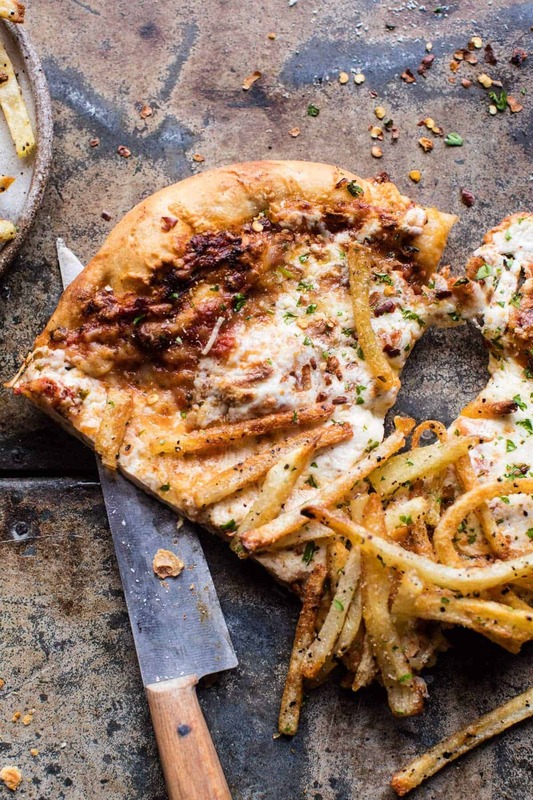 to the well, not so classy…aka my family (who loves a good french fry cheese pizza kind of night!). Alright, so enough of my rambles. I’m kind of ready for another slice of pizza. Who’s with me?! Hello, we're just adding a few crispy oven baked fries to a CHEESE PIZZA. Now come on, how could that not be just amazing?! Place the cut potatoes on a baking sheet and toss with olive oil, salt and pepper. Spread in an even layer. Transfer to the oven and bake for 15-20 minutes, then flip and bake for 10 minutes more, or until crisp. Remove from the oven and toss with parmesan. Meanwhile, bake the pizza. Grease a baking sheet with olive oil. On a lightly floured surface, push/roll the dough out until it is very thin. Transfer the dough to the prepared baking sheet. Spread the dough with sauce and top with cheese. Transfer to the oven and bake 10-15 minutes or until the crust is golden and the cheese has melted. 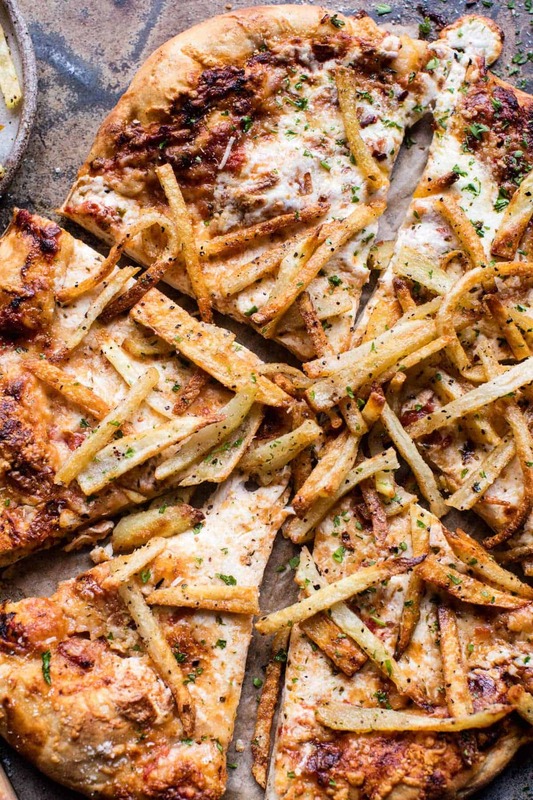 Remove the pizza from the oven and top with fries. Sprinkle on some fresh parsley and grated parmesan. EAT! 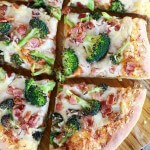 Happy Wednesday…two more days till Friday, and we have pizza to help us get there! Wow this pizza is so fun! Who would have thought this is a thing in Italy, the birthplace of pizza? lol This is like Italy meets USA! The best of both worlds! Oh my gosh I can’t wait to try this especially that my baby girl loves french fries, and with it being oven baked makes it even better and healthier! Haha right? It seems like Italy meets the USA!! I hope you love this one Sheila, thanks!! i had a pizza with “crispy potatoes” this weekend. somehow this meant that there were once crispy, but quickly soggy, potato chips on my pizza. i was thinking thinly sliced roasted potatoes would have been better, but french fries sound like the ultimate toppings! This looks really delicious! The photographs are mouthwatering too! 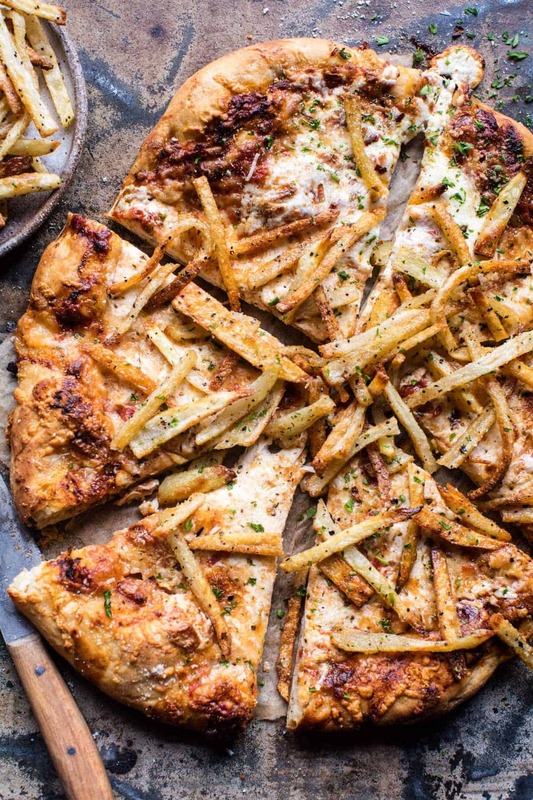 I never heard of french fry pizza either before today! Might give it a try. I hope you do & like it!! Thank you Maëva! I hope you love it just as much! Thank you Celina! whaaaaaaaaaaaaaaaaaaaaaaaaaaat. This sounds so amazing! French fries on anything is basically the key to my heart! The flavors look spot on! Haha Yes!! So glad you are loving this Jessica! Thank you! Holy Guacamole! This pizza is totally killing it, Girl! You’ve managed to make this look (somewhat) more healthy than it really is! Here in NJ we’ve got disco fries which are French fries topped with cheese and gravy…an equally decadent dish. That sounds just like Canadian poutine! Thanks so much Jean!! 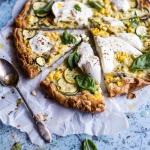 aah I am so excited by this recipe! It combines two of my favourite things, I need this in my life! Omg, what?! Where has this pizza been all my life? This is like the ultimate comfort food. Can’t wait! YES! I hope you love it Andrea! Thanks!! Haha I hope he loves these two together even more! Thanks so much Cherie & I will be sure to pass the message along!! Greatest pizza ever, my boys would love this! What a tasty idea even for the pickiest of eaters! Two great foods combined into one! Yes, perfect for picky eaters! Thanks Mary Ann! Ummm what? French Fry? Cheese? Pizza?! Dying!!! I am so glad you are loving this! Thanks Jennifer! Italians do NOT out fries on Pizza, this a wrong to say that. Actually if you read all of the comments you will see that it is absolutely a thing. You can just google it and find a host of photos and blogs about French fries on pizza. It is called American style in some places and in Naples they have one with hot dogs as well. It all sounds like pure genius to me and I can’t wait to try my hands at this recipe. Ehm, how did you get your fries to look PERFECT. 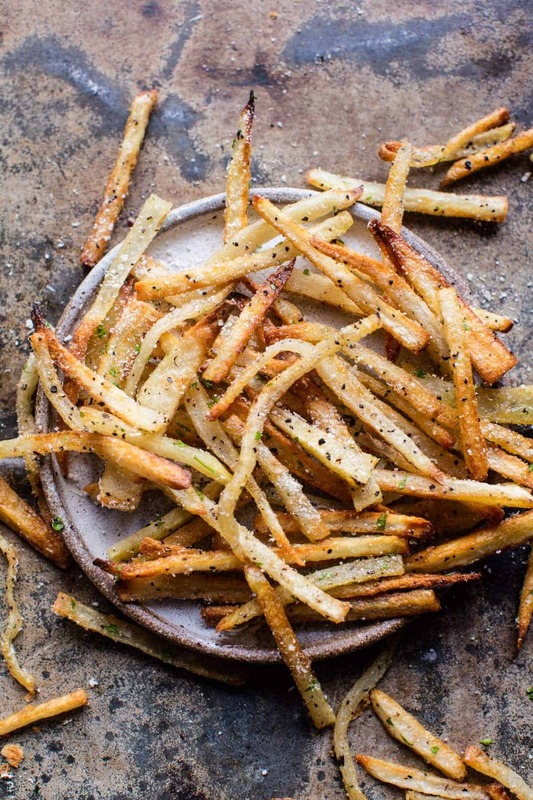 Love all the pepper you did on there– peppery fries are the only way to go! I am so glad you are loving this! And yes pepper is so great! Thank you Sarah! 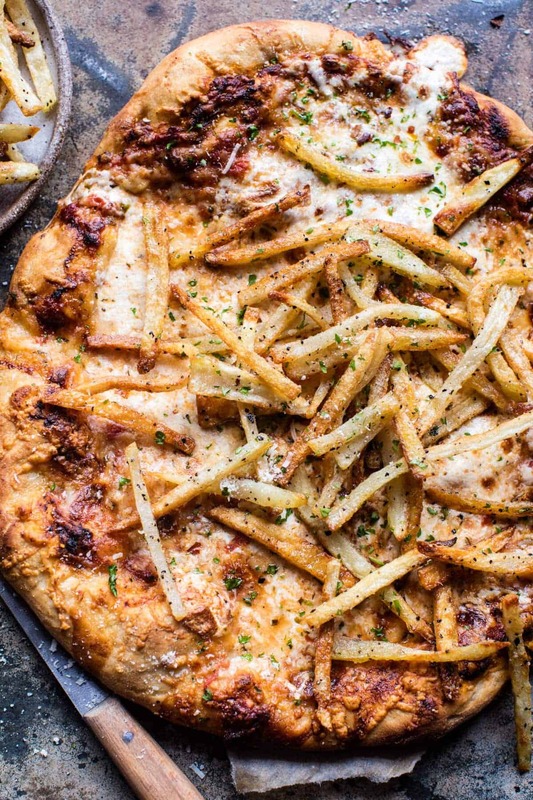 I can never resist a pizza topped with fries! Carbs on carbs sounds like heaven. My inner fat kid is HOOTING and HOLLERING right now… love this! YESS!! Haha! SO what I was hoping for!! Thanks!! I made this tonight and it was so good! 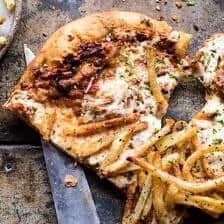 I never would have thought to put fries on a pizza but it really worked. I only used about half the cheese and fries, though, and still had plenty of both. Thanks for the recipe! Thanks so much Mary! Cutting down on the cheese and fries wasn’t a bad idea! Can be a bit to much sometimes!